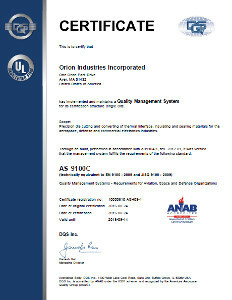 ORION has achieved AS 9100 certification, recognizing ORION as a compliant, reliable and preferred vendor for the Aerospace Industry. AS 9100 is the internationally recognized Quality Management System standard specific to the aerospace, aviation and defense industries. This standard is strongly supported by major aerospace OEMs and is being required by vendors within the supply chain on an increasing basis. The addition of AS 9100 complements ORION's ISO 9001:2015 certification and highlights the company's focus on supporting the stringent requirements of the aerospace, aviation, and defense industries. The AS 9100 certification enables ORION to assure not only potential aerospace customers, but all of our customers, that the quality of our products and manufacturing capabilities exceeds industry standards. The effort and determination set forth by everyone at ORION has enabled us to achieve these standards not commonly seen within our industry. ORION is proud of this achievement and delighted to be a preferred vendor for the aerospace industry. We are dedicated to continually improving systems, maintaining compliance, following protocols and achieving the high amount of customer satisfaction necessary to retain this certification.